The three-month moving average stood at 0.67, still in expansionary territory (“zero” indicates average growth over the 1990-present period). Similar to August, of the four major sectors comprising the index, only the service sector, containing only employment components, made a negative contribution to the measure. 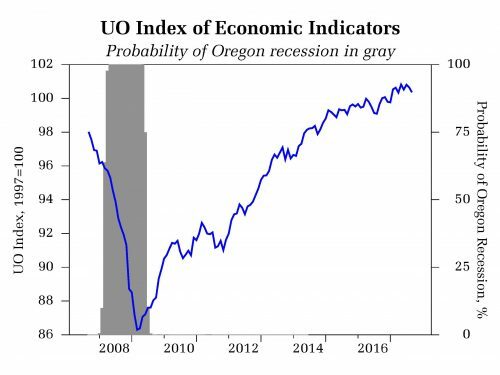 Although the Oregon Employment Department reported a second month of job losses in Oregon, the low level of initial unemployment claims indicates a still solid job market. Note that the employment data is subject to sometimes large revisions. 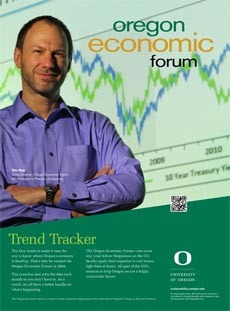 The University of Oregon Index of Economic Indicators fell again in September. The UO index fell in four of the last six months and has tracked sideways almost all year. This behavior is consistent with that of an economy in a mature expansion. Softer employment services payrolls (largely temporary employment) and initial unemployment claims weighed on the measure; the latter remains near historic lows and suggests ongoing job growth. Core (nondefense, nonaircraft) manufacturing new orders made a solid gain, extending the recent upward trend and indicating a clear rebound in spending on business equipment. Building permits (smoothed) rose rose while remaining components were little changed.